This is just the treat to cook for your mum this Mother’s day. Heat the butter in a pan, add in the spring onions and breadcrumbs and mix well. Add in the mashed potatoes and allow the stuffing to cool down. Spread a double layer of cling film onto the work surface. Lightly oil the cling film. Using a sharp knife split the chicken fillets in half. Lay the chicken fillets side by side on the cling film, leaving a gap for expansion. Place another double layer of cling film on top and use a rolling pin to gently flatten out. Then remove the double layer of the cling film from the top of the chicken. Next spread the stuffing on top of the chicken and then using the bottom layer of cling film roll the chicken up into a long cylindrical shape. Meanwhile place a piece of tin foil on the work surface with a little baking parchment on top. Transfer the chicken roulade onto the parchment paper, peel off the cling film and roll up tightly in the parchment and tin foil-this will help to give a good shape to the roulade and prevent it from falling apart. Place in a baking tray and roast for 30 minutes, after which time you should peel away the tin foil and parchment paper and roast for a further 30 minutes. Par boil the potatoes and carrots for 6-8 minutes. Strain and arrange on a roasting tray with the chicken, slot in the onion wedges and chopped leeks. Drizzle with a little oil, honey, season with salt and pepper and roast with the chicken for 30 minutes (having removed the parchment and tin foil from the chicken). 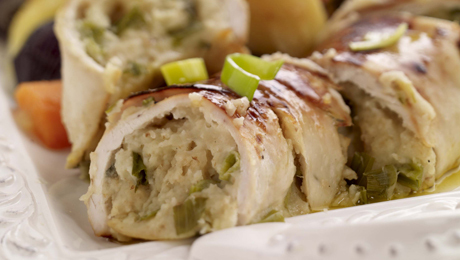 Serve immediately with the chicken roulade. Thinly slice the leek into strips. Heat a medium sized pan with a little oil and sauté the leeks until gently softened. Add in the butter and season lightly with salt and pepper. Drizzle this on top of the chicken.